Edison and Tesla. Muhammad Ali and Joe Frazier. The Red Sox and the Yankees. We all know about these great historical rivalries, but today, we’ll settle the on-campus burger debacle. UBurger vs. Tasty Burger! Which reigns supreme? We’ll be pitting UBurger and Tasty against each other in five different burger joint categories: the burger, the fries, the shake, the joint and the price value. And in the end, we’ll come to a definitive answer on the better burger. For the sake of fairness, I ordered each place’s popular menu items. At UBurger that was a cheeseburger with fries and an Oreo shake, and at Tasty, that was the Big Tasty with fries and a vanilla shake. Let’s start with UBurger. As soon as you bite into the burger, you immediately relish the crisp crust of the bun, which gives way to the soft interior and the exquisite sauce, and then… nothing. The burger was practically a sauce sandwich with bits of crunch here and there when you bit into a pickle. Despite being practically soaked in sauce, the patty was still completely dry and flavorless, like eating chewy-air. Furthermore, don’t ask me how, but UBurger managed to make a burger with no structural integrity. You had to hold it perfectly flat or else lettuce, onions and even a pickle would just slide right down the bun. As for Tasty, everything was on a higher level. The patty was nice and juicy, but not overpoweringly so, and the toppings were perfectly complementary to the burger. It wasn’t as greasy as you would expect either, and left you feeling full, but not bloated. Round one goes to Tasty. Fries are a quintessential side to any burger, and my god do these two places make some good fries. Tasty’s were incredibly crisp, and I couldn’t find a single one that was limp. They were flavorful and perfectly salted — although a bit greasy. But regardless of how good Tasty’s fries are, it’s hard to stand up to the literal mountain that UBurger served. 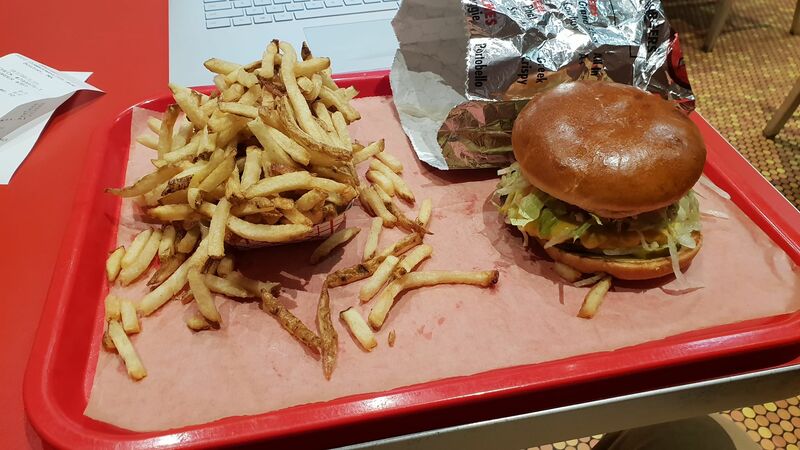 Side-by-side, I got more fries than I did burger, and that was a small order of fries. They weren’t bad either. Not as good as Tasty’s, but they held up well enough. In my mind, when it comes to fries, drastic quantity differences overrides a smaller quality difference. Round two goes to UBurger. It’s not that hard to make a milkshake, which makes whatever UBurger served me that much less excusable. They used a one-to-one ratio of base to oreo, and to anyone who’s ever tried this, you know that the result is the consistency of fresh cement. It was so thick that it took a grand total of 53 seconds to get through the straw. Sure, it was really sweet and nice, but you only get to experience it after your lungs implode trying to take a sip. As for Tasty’s, well it was nothing special. It was just your run-of-the-mill vanilla shake, and after that monstrosity from UBurger, I was delighted to know that this drink was designed to be sippable. Round three goes to Tasty. I was shocked when I learned about UBurger’s hours. They vary depending on location and day of the week, with the latest close time being 11 p.m. These hours are out of place for a burger joint, especially when Tasty stays open until 12 a.m. at the earliest and 4 a.m. at the latest. Yes, by that time it’s mostly surrounded by intoxicated Red Sox fans and is all around a little sketchy, but it’s nice to have options. Tasty’s Fenway location had a spacious indoors compared to UBurger in West Campus, but either one would do for a group of friends. Tasty, being the more popular of the two, was often swamped — making it difficult to even go near the location at times. UBurger additionally has two branches on either end of campus, so you’re never too far from a location. Round 4 goes to UBurger! It’s anyone’s game at this point folks! Although UBurger’s cheeseburger and shake were both absurdly priced at $6.15 and $5.50 respectively, the fries more than made up for it — considering they fed two hungry students for $3. Not to mention they were really good. As for Tasty, the Big Tasty was more than worthy of its $6.25 price tag. The vanilla shake, although smaller in quantity than UBurger’s, was superior in quality and was still well-priced at $4.75. As for the fries, they were nowhere near the value of UBurger’s, but still satisfactory for $2.75. Round 5 goes to Tasty! Tasty comes out victorious in the battle of the burgers. Case Closed!